"MAY THE MEMORIES YOU SHARED WITH BARBARA BRING YOU..."
"My condolences to the family of Barbara .may you fine peace..."
"I am so sorry for your loss. The Cooper family lived next..."
"I am so sorry for the loss of your loved one. Please find..."
AUGUSTA - It is with a sad heart that we announce that Barbara F. Cooper, age 93, has entered into glory early in the morning of Tuesday, Feb. 5, 2019. She passed away at Augusta Center for Health & Rehabilitation following a long illness. She was born in Augusta on April 12, 1925, to the late Albert and Etta (Jackson) Dostie. 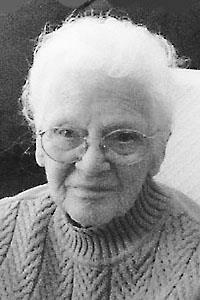 She grew up in Augusta and graduated from Cony High School in 1944. She later went on to graduate from University of Maine at Augusta where she earned her Associates Degree. She was married to the late Arthur Cooper on Jan. 23, 1948. During their loving marriage, Barbara got to see much of the country and the world due to Arthur's job with the U.S. Air Force. She always talked fondly about living in Seattle, Wash. and London, England, among many other places. Barbara had a variety of jobs including working for the government during her husband's military years, as well as Country Manor Nursing Home and enjoyed working for Uplift for many years working with the mentally challenged. After retirement, she also enjoyed working for her friend Terry Brann doing deli and catering. She was a lifelong Boston Red Sox fan, like her father and always looked forward to the first game of the season. Barbara is now with her parents Albert and Etta Dostie' her siblings, Richard, Roland, Donald, Dorothy, and Louise; and her husband Arthur Cooper. She was also pre-deceased by two of her children, a baby Nancy Cooper and a son James Cooper. She is survived by her son, John Cooper of Augusta, and her daughter and son-in-law Jeanne and Donald Bilodeau of Litchfield; grandsons, James, Joshua, Adam, and Aaron; her ten great-grandchildren; and by her many nephews and nieces. Special niece Jan Karczewski spent much time with her. She enjoyed going to Jan's July 4th parties with her family. At her request, there will be no public visiting hours or funeral service. There will be a celebration of life from 2-5 p.m. at the Calumet Club on Saturday Feb. 16, 2019. A graveside service will be held in the spring in Highland Cemetery, Jefferson. Arrangements have been entrusted to Plummer Funeral Home, 16 Pleasant St., Augusta, Maine. Condolences, photos and memories may be shared at www.plummerfh.com. The family would like to extend a special thanks to the staff at Augusta Rehabilitation Center for their kind, caring for mother and Constellation Hospice Services.